The largest collection of books in the world is the Library of Congress with 30 million books but the Strand with almost 3 million books would still be quite a private collection if they stopped selling books today. Certainly the Strand has more books of any single bookstore in the country (Amazon may possibly have more books, but then, they have pretty much everything) and possibly some smaller chains. There are two main ways to look at one bookstore having so many books: one, they treat books like Costco treats all its products and wants to offload as many books as possible to make the most money as possible, or two, they treat books like the Library of Congress treats its collection, with care and dedication with the idea of spreading literacy and being a general good to society. Are Strand’s books merely objects that exist to make the owners money and are simply what they choose to make money with? Or are they things with meaning? To answer that, we need to look at how the Strand presents its books and, by extension, the way they market themselves to the public. Having eighteen miles of books and accompanying shelves to hold all of it, my floor plan may prove somewhat inadequate of showing the scale of how large the Strand is. Regardless, the first thing one sees walking into the Strand for the first time are the large tables of books organized by “Classics”, “Best of the Best”, “Bestsellers”, and so on. At a single glance, this setup is similar to any other chain bookstore, putting the most popular and well-known books upfront to keep people in the store. The difference here being that the line of tables stretches almost the entire length of the store. Most chain bookstores simply have anywhere from one to three, or even four, tables organized like this before opening up to the wider store. Any key difference is the sensory overload of books contained in the store. Some people have called the Strand a Mecca of books, a booklover’s paradise, and it would seem a little intimidating with eight feet tall shelves that require stools to access some of the higher books. But as you see from the pictures, the lighting is kept very bright and airy, even when a customer is squished between the other customers and the books themselves. 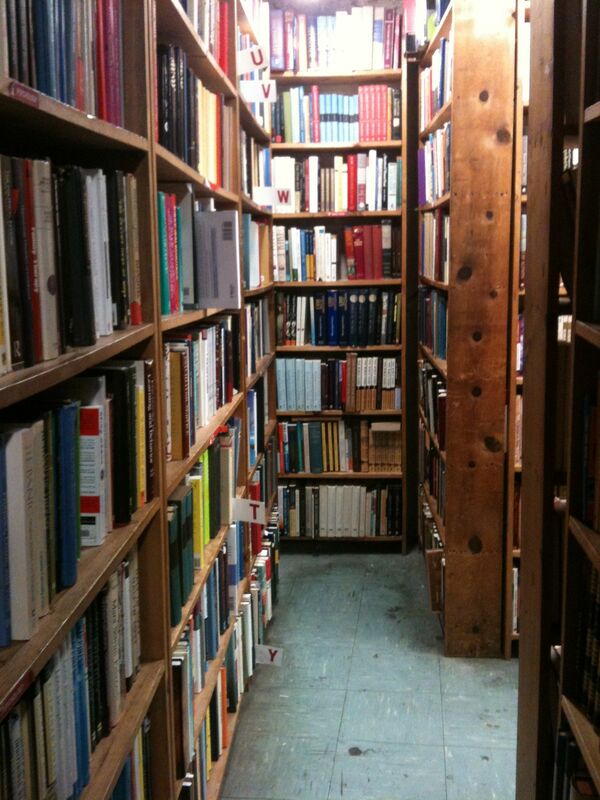 There is certainly room to wander, but that wandering is contained more to searching for a book in the labyrinth, rather than the actual store itself. One thing you won’t see in most other bookstores, independent or chain, is the branded merchandise. Located off the side of the checkout, situated almost like the candy in a grocery store to get one last impulse buy, a customer can come out not just with a book or two but tote bags, shirts, magnets, bookmarks, notebooks, stationery, glasses, calendars, gift cards, etc. None of these are really connected to books besides the obvious bookmarks, but when the Strand is such a big name already, why does it need all the merchandise? Going deeper into the dichotomy of “corporate” vs. “independent” what kind of books does the Strand put on the first floor of their store? Yes, some curious visitors will go to the other floors, but most people just sightseeing and buying a souvenir are less likely to go to the other floors. You have your generic “Fiction” in the back shelves, the bestsellers on the tables, cookbooks, history, travel guides to New York, and New Yorkicana (New York/Americana.) The second floor keeps the more “genre” and “niche” books like the art and architecture books, young adult, graphic novels, and children’s with a similar layout to the first floor. Anyone silly enough to like books outside of the mainstream literary culture have to go up the stairs to find what they’re looking for. Additionally, on the third floor is the Rare Book Room with a far more elegant and traditional air to it than the rest of the store (you can even rent out the room for wedding receptions, it’s that fancy.) The shelves are all against the walls and what few tables on the floor are spaced farther apart and hold fewer books than tables on the lower floors. The room even has chairs where you can actually seat down and read. Here lies the complication, the first floor has the trappings of being any other bookstore in America, pack in all the books guaranteed to sell and put all the special interest in a more out of the way place for the dedicated fans to find. On the first floor, books are simply commodities and while you’re at it, why not buy a mug to drink some tea while you’re reading your book? On the third floor, however, seems to be where the Strand has taken all their passion and love for books and stored it there. But the question is whether the Rare Book Room is a only a museum of books or a place where books can actually be appreciated for their rarity and value. In fact, the most expensive book in the Strand is $45,000 dollars. But as Fred Bass says in the “About Us” video on their website, the pride and joy of the store is a signed, illustrated copy of Ulysses where Joyce realized the illustrator (Matisse) had drawn pictures from the original Ulysses and refused to sign anymore after that. That anecdote does give humanity to the store, it’s not the most expensive item but perhaps it proves I’m being too harsh on the store. So going back to my opening, does the Strand really care about books? 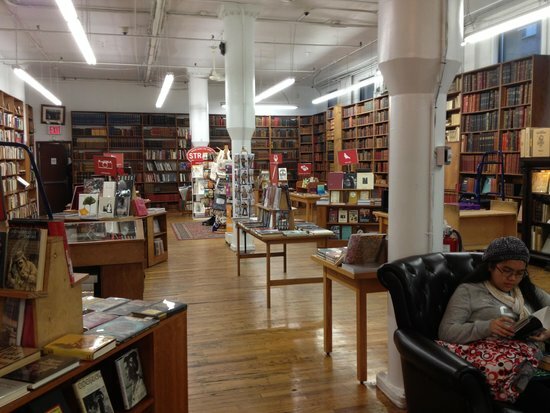 Yes, I believe the history of the Strand and the fact that it’s been run by the same family does lead to think that while the Strand may be trying to brand themselves more to get some more profit, the Bass family’s love of books can’t really be denied. The question is more one of integrity, if they were care about books, a skeptic may say, why do they sell them like it’s a fire sale? Are books more than objects to be sold in a cold, capitalist manner with only an eye on what sells the most? Bruno Latour says about things that it is “in one sense, an object out there and, in another sense, an issue very much in there, at any rate, a gathering.” The issue here being, has the Strand “sold out?” Have they been more corporate and sacrificed that unique, communal sense of local identity in favor of tourist dollars? In this case, the books are almost secondary, more about what they represent than just being ink and paper. 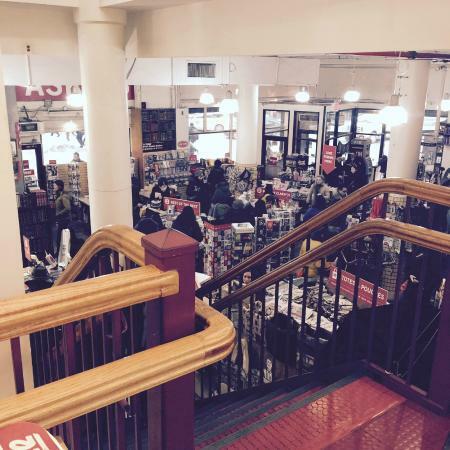 What separates the Strand from Barnes & Noble or Books-A-Million? On the surface, very little. But unlike either of those two, Strand does employ people who genuinely know and care about books. So perhaps the real measure of the Strand is not the books inside them but the people who fill them. Perhaps the Strand will only have lost its soul when it starts employing people who are little more than cashiers who just happen to work at a bookstore, rather than true booklovers who want to spread the good word to anyone who enters the store. Latour, Bruno. “Why Has Critique Run Out of Steam?” Critical Inquiry. 2004.